1. Cook the pasta in a large pan of boiling water for 10–12 minutes until tender. 2. Meanwhile, gently cook the pancetta in a small non-stick frying pan for 5 minutes until crisp and lightly browned. 3. Drain the pasta and cool under running water. 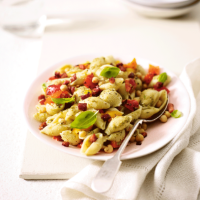 Toss with the pancetta, pesto, chick peas and peppers. Scatter over the basil leaves and a good grinding of black pepper to serve. This dish can be eaten warm or cold. Make ahead and chill for a day or two, then remove from the fridge an hour before serving.